Justine Greening MP was out on Putney Foreshore Sunday morning with local residents taking part in a foreshore deep clean organised by Thames21. Over a hundred residents turned out and got stuck in clearing the foreshore of litter, glass, scrap metal and rubber at the first deep clean of its kind along the Putney stretch of the river. 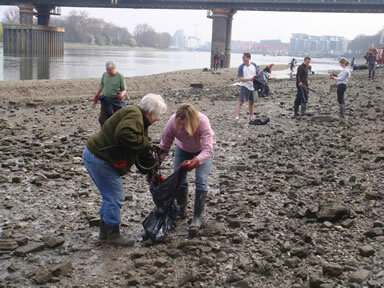 Thames21 is an environmental charity that works with communities to bring London's waterways to life. 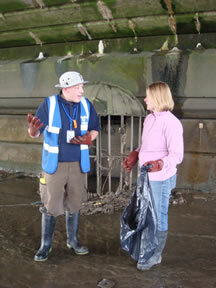 The Putney deep clean on Sunday was one of many clean ups that Thames21organise in London throughout the year. “It was great to see so many residents up and down the foreshore rolling up their sleeves and really making a difference looking after our river and local environment. The amount of rubbish cleared from the foreshore was huge. Though the sewage problem is less obvious to the naked eye, it was clear that a significant amount of pollution comes directly from the combined sewer overflows under Putney Bridge which regularly discharge raw sewage straight into our river. Last week Justine also held the first meeting of the Thames Tunnel Working Group she has set up. The group will look at tackling the problem of untreated sewage in the Thames and the issues raised by the Thames Tunnel preferred sites locally at Barn Elms, Putney Bridge Foreshore and King George’s Park. The group will be meeting regularly over the next couple of months liaising with Thames Water and the independent experts Justine has secured to look at what a better Thames Tunnel solution would look like for the local community. If you would like to be kept up to date with Justine’s work on the Thames Tunnel or you are interested in helping out with another river clean up, please do get in touch with Justine.